I have a minor culinary obsession with chickpeas. They’re inexpensive, high in protein, iron and fiber, low in fat, and can help lower cholesterol. I buy them in 6 lb. cans, by the case. I’m amazed by chickpeas’ versatility, and they’ve become the staple of one of my favorite healthy, fast, at home meals…chickpea tacos! This couldn’t be easier! I add the chickpeas, liquid, and taco seasoning to a skillet and cook it over medium-high heat until the liquid is absorbed. 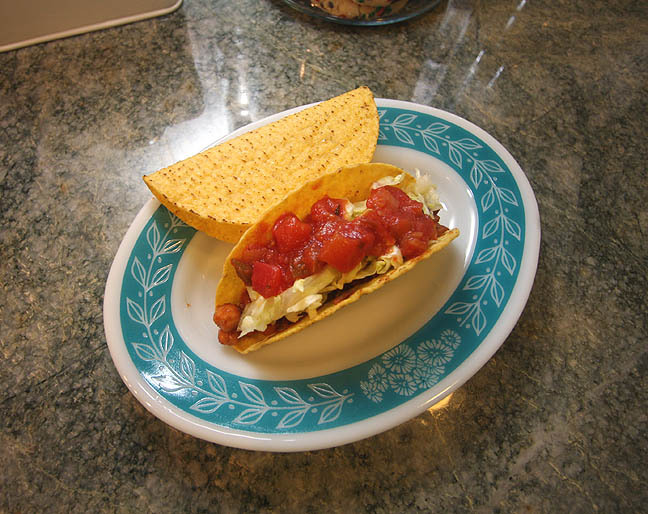 I usually serve the chickpeas in hard taco shells with lettuce and salsa. I’ve also served them in flour tortillas, or over a bed of romaine for a quick & healthy taco salad! *Or two 15 oz. cans of chickpeas, one drained and one undrained. This sounds and looks so good I am going to try this tonite for dinner. Wish I could try it now, thanks.